Compared to the one that was removed, the left cataract has been developing very slowly. Removing the cataract required a team of veterinary ophthalmologists and anesthesiologists. Dr. Katie Diehl and Dr. Meredith Voyles led the surgical effort, and Dr. Jacob Johnson was the anesthesiologist. “The ophthalmic surgery and the anesthesia are technically difficult, and our veterinary specialists and staff did an exceptional job caring for her,” Bellah said. Tiger was on her feet the evening of the surgery and has since been flying in her aviary as recovery continues. In the weeks to come, Raptor Center educators hope to have Tiger back in front of audiences interested in learning about birds of prey and wildlife conservation. Tiger, who is also known as War Eagle VI, came to Auburn in 1986 and was the first of Auburn’s eagles to fly freely in Jordan-Hare Stadium. 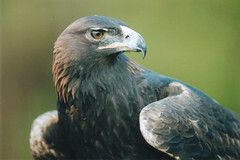 At the Georgia game in November 2006, she made her last stadium flight and is now “retired.” Golden Eagle Nova was then inaugurated as War Eagle VII. NOTE: For downloadable images of Tiger (War Eagle VI) and a video to accompany the story, go to http://ocm.auburn.edu/featured_story/tiger_surgery.html.